Everyone loves the savory tastes of grilled foods on Fourth of July. 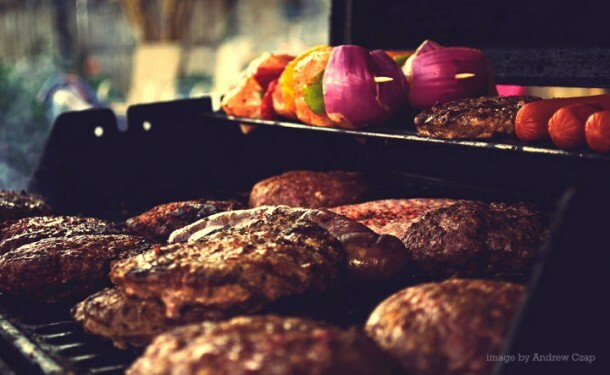 Grilling is easy and healthy, but why not try some new flavors for your grill like my Jalapeno flank steaks, turkey burgers or chipotle shrimp? And while you’re manning the grill, offer your guests cool classic drinks like pomegranate margarita or caipirinha and delicious snacks such as my favorite salsa and guacamole! Just be sure to slap on plenty of sun-screen! With 4th of July coming up this weekend, many people are going to invite their friends and family over for BBQ. Grilling is one of my favorite summer-time activities, so I wanted to reintroduce a healthier burger option: turkey burgers! Besides ranking high as an antioxidant, pomegranate is delicious, tart and sweet at the same time. Margaritas are fun for entertaining and a great way to refresh thirsty guests at your next BBQ or picnic. Summer BBQ, here we come! Orange is the perfect summer flavor and the Vitamin C protects your skin while you are grilling in the sun. The first time I had this sunny Brazilian drink, it was in the dead of winter vacationing in North Germany! Germans adore its slightly sweet and absolutely refreshing flavor, the perfect remembrance of their summer holidays abroad. Whenever I invite guests over during the summer – I serve plenty of guacamole because it’s so popular! Many friends have told me that their guacamole is not nearly as tasty and I think I know what the trouble is: Make sure that your avocados are completely ripe before cutting them open. Press the skin of the avocado – it should give slightly, the same way when you squeeze an orange. I buy mine 2-3 days before my party and store them on the windowsill. If your guacamole tastes bland it might need more lime juice and salt, taste as you mix. Double Dipping, Make it a Salsa Party! When I say “double dipping”, I don’t mean dipping your chip twice! I meant doing double duty by having fun and eating more fruits and veggies at the same time. In my family, any holiday when food was served, was deemed a “major event”. The Fourth of July was no exception. When I wasn’t busy burning myself with sprinklers, playing badmitten, or playing horse shoes, I would be helping Granny set up the buffet table for yet another family feast.